Summary: Oil painting showing three young children watching a chimney sweep at work in their house with amazement. Their mother looks on from the top of the stairs. Description: There are at least three versions of this painting which indicates its success and popularity. Cranbrook Colony artists constantly depicted children, always attentively and compassionately, often with elements of gentle humour. In this painting, three children are amazed by a chimney sweep, probably of the same age, disappearing in the chimney. Although rather sentimental, and not exactly attacking the social system of the time, the painting still corresponds with issues raised by Charles Dickens in his famous novels which called the public's attention to contemporary social evils, such as poverty and child labour. Description: It is early in the morning and the children in the house watch with fascination as the chimney sweep sets about his work. According to James Dafforne, writing in The Art Journal of 1875, the painting was inspired by a real life event that took place in Hardy's own home. It was such a popular subject that Hardy painted several versions and it was engraved and published by Graves in 1865. Although the public may have assumed it was a reference to the use of 'climbing boys', this was probably not Hardy's intention. 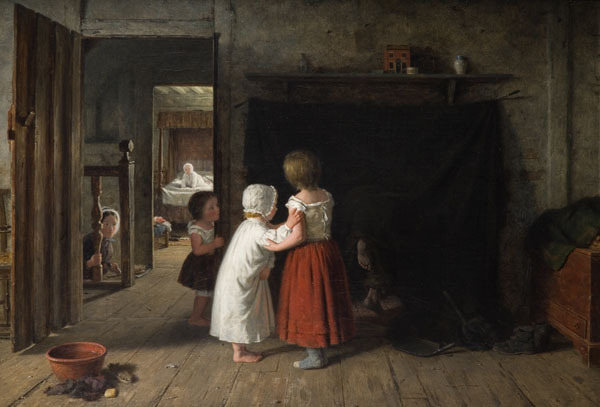 The boots to the side of the fireplace are that of a grown man and the use of children as sweeps was outlawed in 1840, several years before Hardy painted this work. The setting fort the work is the first floor of a house in Carriers Lane, Cranbrook, now Cranbrook Museum.